At least 20 workers accused of working on an army-backed dam construction site in the south-western Pakistani province of Balochistan have been shot dead by a large group of gunmen, officials say. Police say that the gunmen overpowered eight security guards, and shot the labourers on Friday night. A separatist group said it was responsible for the attack. Taliban militants, Baloch separatists and other groups fight in the Balochistan region, which borders Iran. The separatist Balochistan Liberation Front said it carried out the attack. A spokesperson told the BBC that the target was the Pakistani army and those working for its construction projects in the province. Police told Pakistani media that the attack appears to have been an act of targeted killing - all the dead were from outside Balochistan. The attackers fled on motorcycles. At least three labourers were wounded. The attack took place near the south-western town of Turbat, police say, which is considered to be one of the restive areas of Balochistan. It is also the home town of the chief minister. Senior Balochistan official Akbar Hussain Durran told the AFP news agency that the labourers were lined up and shot at point blank range after identifying themselves. 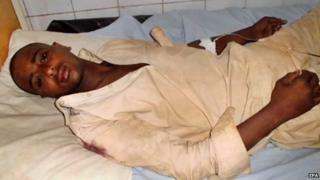 He said that paramilitary troops guarding the labourers fled when confronted by such a large number of armed attackers. The Pakistani security forces are often targeted by separatists who accuse them of persecuting Baloch nationalists. Rights groups have also accused government forces of arbitrary killings, torture and enforced disappearances. The army argues that it is fighting to keep Pakistan together. Both the military and the insurgents - who want a greater share of revenue from the province's substantial gas and mineral resources as well as more autonomy - deny human right abuses. Balochistan Home Minister Sarfaraz Bugti said that paramilitary Frontier Corps troops were searching in the nearby mountains for the attackers. "We will chase them down and bring them to justice," Mr Bugti said. "We need help in this war against terrorists. Alone, we cannot fight."